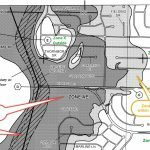 Home→elevation certificate→What is a Flood Study? Residents along Wolf Creek used to see more flooding until two dams along the waterway at North Street in Pine and East Main Street in Grove City were removed 11 and 12 years ago, respectively, and the waters have receded significantly. Since that time, the residents believe their insurance is no longer justified – or could at least be reduced. FEMA’s Flood Insurance Rate Maps (FIRMs) determine the flood insurance rates that FEMA charges landowners who are located in a Special Flood Hazard Zone. 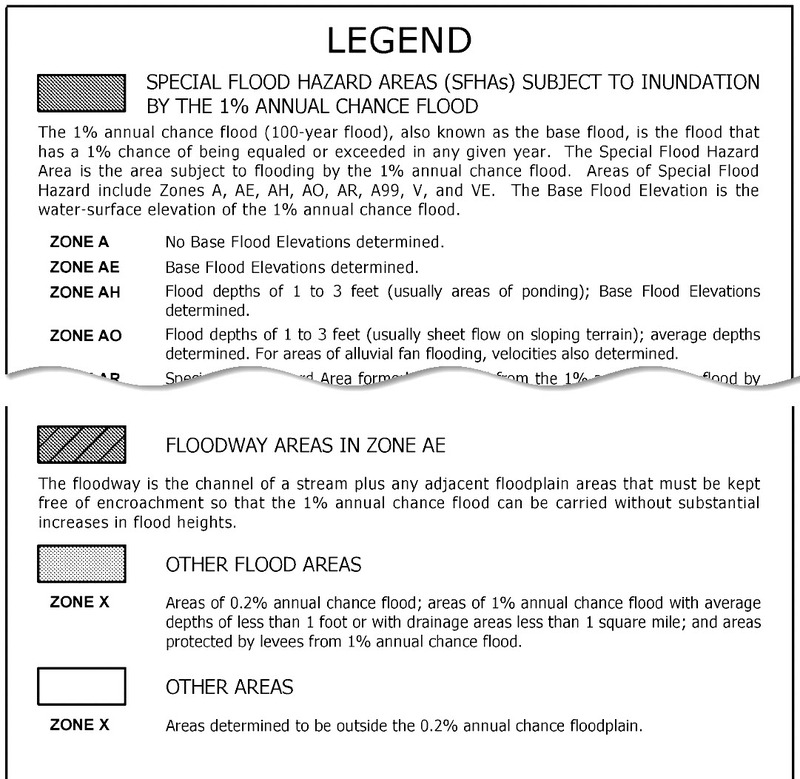 This is also known as the 1% Chance Storm Flood Zone and is typically designated as Zone AE. The “E” means there is a Base Flood Elevation that has been established. Out of the flood hazard zone completely, the best situation. This is usually designated as “X Outside the 0.2% Chance Flood Zone.” In this case you are not required to purchase flood insurance, though you may consider doing so if you have a wet weather drain close to your house. 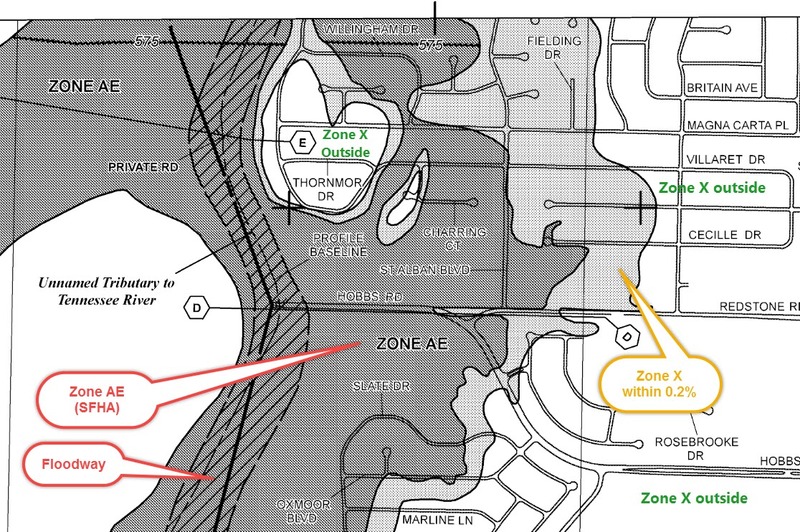 A portion of your lot and/or home is shown in the flood hazard zone on the Flood Maps. This requires flood insurance, or proof that the maps are inaccurate. At this point your home may or may not be actually below the Base Flood Elevation, the 1% chance flood elevation. Your lot is IN the flood zone, but your house and the Lowest Adjacent Grade (LAG) next to it is OUT, or ABOVE the Base Flood Elevation. This has to be determined by a land surveyor. If so, you may qualify for a LOMA to remove the requirements for flood insurance. Your house and/or the Lowest Adjacent Grade (LAG) are BELOW the Base Flood Elevation. You won’t qualify for a LOMA. Get an Elevation Certificate by a land surveyor in order to determine your flood insurance premium. In this article, a FOURTH situation is given; you are shown IN the flood hazard zone on the current maps but something has changed since the map was published that would show you to actually be OUT of that hazard zone. In this case, a flood study has to be undertaken to prove to FEMA that something has changed. Unfortunately this flood study has to be paid for by someone. If your City and/or County won’t do it, then it is up to you or your neighbors to undertake this study. The flood study in this article ultimately costs over $35,000. In my experience, the minimum flood study cost I’ve seen is in the $5000 range. It could run much higher, but that would usually involve a large area. Unfortunately when most people are in this Fourth Situation, neighbors won’t cooperate and share the cost. I believe personally that the city or county should incur these costs, but in most cases, there aren’t funds available for this. And, since it involves a small segment of the people, it is usually not justified by people who were voted into office. Another possible way to fund a flood study is through a Tax Assessment from the jurisdiction involved. This would require the individuals who are helped by the flood study to pay up when and if they sell their home. The idea is that being out of the flood zone would mean they get a higher price for their home than if it was still in the flood hazard zone. If you need help with an elevation certificate, please call ​Hideaway Land Surveying today at (903) 525-6405 to speak to a Registered Professional Land Surveyor.